It’s all change when you have a new addition to the family, especially for any other siblings and it can take them a while to adjust to their little brother or sister. Here’s a useful guide to approaching the subject and introducing baby to siblings. For parents, it’s an exciting time to have a new baby and increase the size of your family. But as much as you may be thrilled about the new arrival, for existing siblings the changes that are occurring can be a bit disrupting and they may not initially share the same excitement as you. One of the main issues that arises for other siblings is that they find it hard to no longer be the baby of the family. They feel like they may be ‘forgotten’ and ‘overlooked’ by you, as you’ll be fully focused on the newborn baby and not on them. Due to worries such as this, however mad and untrue they may seem to you as adults, sibling rivalry can occur. 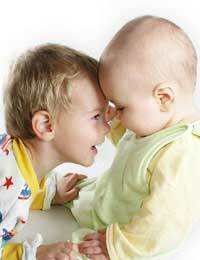 To try and avoid sibling rivalry between your children and reduce the chances of it occurring at all, there are plenty of things you can do – both before and after the birth of your newborn baby. Firstly, it helps to be open and honest as with your existing children, explaining as soon as possible about the new baby and what it means. If you have young children or toddlers, then it’s a good idea to not do this too soon, as they have no concept of time during your pregnancy and may well have forgotten about your chat by the time the baby actually arrives. There are some good books about new babies and pregnancy that you could use to illustrate your points and demonstrate how other children sometimes feel when they suddenly have a sibling. When the baby first comes home from hospital the reality of having a new sibling often becomes clearer for an older child, especially when they realise the newborn baby is getting heaps of attention. So it’s a good idea to get them as involved as possible with what’s going on, so they don’t feel left out. For example, as the baby is likely to be receiving presents from various people, your other sibling could help Daddy chose a present for the baby, or he could help unwrap any gifts given to the baby. As day-to-day life sets in, your other child could help with simple tasks, like bathing the baby, choosing clothes for it to wear or even pushing the pram. Mum is likely to be busy at regular times with feeding the baby, and this another time when a sibling can get a bit jealous. Try and make it clear to your toddler or older child that they can and will have time with you too. Set aside some time each day to spend with them, playing or reading a book at bedtime, away from the baby. In between all of this, offer plenty of reassurance that you love them just as much as ever and give them lots of hugs and kisses. It’s a big adjustment getting used to being part of a larger family, but with care and attention, an older child should be able to get used to the changes and accept them as best as possible.